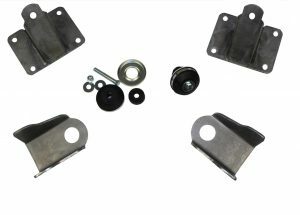 Installation Instructions for CP-4143 Mopar 340-360 V8 Engine Swap Kit for 1933-1935 Dodge Pickup, 1933 Dodge DP and 1934 Plymouth PD. May fit others, complete interchange is not available. Steering must be changed to use with original solid axle. Frame mounts will bolt to a flat area on the frame. If they don’t match you have a frame not covered by this kit. 1. Clamp frame mounts in place as. Mounts should center on a flat area. Set engine in place to make sure you have the correct positioning. 2. Drill top holes through flanges. The flat area these mounts sit may or may not have holes already in the frame. These come in different sizes, some slotted, and in different locations. Most however are usable as the bottom mounting holes. To mark for drilling, reach inside the frame with a stub pencil and mark the location on the frame mount. Do this to only the bottom 2 holes on each side. Remove mounts and drill these holes. 3. Reinstall frame mounts and bolt in place. Use bolts that match the hole size. Note: because of size differences, these bolts are not included in the kit. 4. Bolt Chassis Engineering engine mounts to the engine wutg the offset extending forward.